I never drive (north) down the Pine Street hill and turn left (west) onto Brown Street without appreciating the cozy homes on both sides of the street recognizably old yet somehow timeless. For years I passed them by paying little attention but was somehow calmed by the varying styles that look like a picture of happy families. Now I know it was intentional that I and others should have those feelings. You may not be aware that there is a reason those two blocks and a number of others in Martinez and the East Bay look like "home" three-quarters of a century later. They were designed that way by Walter W. Dixon, an Oakland architect who was the unsung but energetic proponent of "storybook style" homes throughout the country during the 1920s and 30s. I first learned about them three years ago when the Martinez Historical Society Home Tour featured one home thought to be based on a design by Dixon, the Alan and Katherine Hern home at the corner of Pine and Brown Streets. It was originally built for prominent 1930s Martinez businessman Les Mullen. Nearby is Sharon McNally’s Brown Street home, originally owned by volunteer fireman and Shell Chemical plant supervisor Frank "Red" Harrow and his wife, Grace. A dozen or more other examples of "Storybook" houses exist in the three or four blocks of Pine and Brown bordering the site of the original Christian Brothers winery. The Storybook style was a reaction to modernism, the carnage of the First World War, the influenza pandemic, and societal upheaval and change. The standard Period Revival house built for middle class families in the 1920s evoked a rather dreamy version of cottage life in previous centuries in England, France, Spain or the American colonies. Storybook heightened the detail in those styles including gables, turrets and vaulted ceilings borrowed, in the words of one writer, from lands that existed only in imagination. The end result was homes that Father in Father Knows Best could have been raised in. Indeed, "Hansel and Gretel," "Disneyesque" and "Romance Revival" are other descriptors used for the style. Dixon and his partner, builder R. C. Hillen, were tract-oriented, developing in communities such as Oakland and Alameda neighborhoods that exist intact to this day. Dixon was also a skilled marketer whose popular book of plans for small homes, "Home Designer Magazine: A Book of Plans," touted the style and made it accessible to individual builders including those who built the houses on Pine and Brown Streets. He sold house plans based on his own designs and those of other Bay Area architects who specialized in the style. As the years passed, Dixon added unusual amenities for the time including two-car garages and automatic garden sprinkler systems. He and another builder coined the terms "miniature mansions" and "modest mansions" to describe their homes. Proclaiming himself "an authority on small home design," Dixon believed that everyone should have a home who wanted one. His designs focused on small five or six room homes of just over 1,000 square feet which often seemed larger because of the open-ceiling living rooms, rounded fireplace nooks and ample windows.. No space was wasted with the possible exception of the barrel-vaulted living room ceiling he fancied. He often included built-in buffet and china cabinets in the dining room if there was a dining room. Dixon occasionally used a breakfast nook design thereby leaving space for a larger living room. The breakfast nook might have foldaway tables and seating and he frequently used hidden wall beds, even in the living room. French doors separated the rooms in the living area and all rooms featured large windows often with a curved wooden molding over the top as in the Hern home. He loved light and curves as well as gables and nooks and window seats. Although small, many of the homes are "one and a half story" with the second story smaller than the first thanks to a steeply pitched roof. Another favorite Dixon style is the split level with living rooms on one level, the master bedroom five steps up and an additional 10 stairs leading to an attic, either unfinished or built as a bedroom. However, Dixon’s real success was in not ‘over-doing’ the fairytale theme. According to one writer, "his storybook style was quieter than that of some of his contemporaries -- less ragged brick, fewer wrought-iron grills. His magazine inveighed against too much ornamentation. His interiors were often plain stucco walls with restrained moldings. He avoided plate rails." As is inevitable with design fashion, Storybook Style went out of style at the end of the 1930s not so much because of World War II as much as the growth of post-modern architectural design and the rapid growth of large suburbs instead of small neighborhoods. 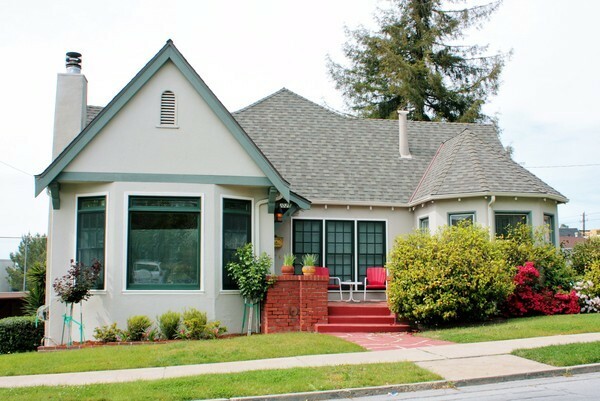 But as with some design, Storybook became timeless with landmark Bay Area neighborhoods being preserved and new owners in Martinez such as McNally and the Herns excited by their homes and committed to restoring and preserving their early 20th century charm.